Laura was born and raised in Hawaii, surrounded by the music of the islands, her Dad's piano and tenor banjo playing, and the rich harmonies of the church choir. She moved to the "mainland" and started playing old time banjo when she was 25 years old. She's been playing and singing ever since, concentrating her repertoire on folk, traditional old time singing, and banjo tunes. She taught in the public schools for 23 years, singing with the kids as much as possible. Happily, she has closed that chapter of my life, although she still loves to work with kids and music. Now she teaches banjo and guitar lessons and sings and plays with as many friends as possible, having been denied that opportunity while she was slogging along as a public school teacher! 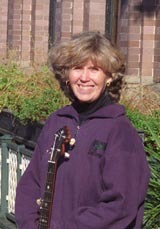 She has taught at PSGW since 1982, with classes in banjo, guitar, song repertoire, and hula. Other camps she has taught at include the American Banjo Camp, the Georgia Strait Guitar Workshop, and the California Coast Music Camp. Music camps are her favorite place to be! She played in a duo with Larry Hanks for many years, and more recently has played a fair amount with Steve Palazzo in California and with numerous friends in Bellingham, Washington, where she lives.